Go back 15 years or so and English wine had a pretty unpalatable reputation. Even the winemakers themselves would admit their offerings were considered something of a laughing stock. Yet fast-forward to today and English wine is continuing to enjoy something of a renaissance, both critically and in terms of sales. Such has been the increase in quality over the past decade, that in numerous blind-tastings, today's best English wine can hold its own against similar bottles from the more traditional winemaking nations. 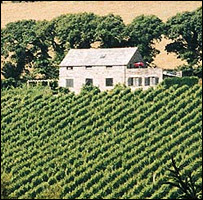 English wine is now stocked by most of the UK's big supermarkets and specialist wine retailers. Bob Lindo, a laidback but equally passionate winemaker from Cornwall, is one of those who has experienced first hand the change in fortunes for English wine producers. "We were the biggest joke in Cornwall when we first started out in 1989," he admits with a broad smile. "A lot of people thought we were mad." Since then Mr Lindo, 55, has more than made his early critics eat - or perhaps it should be 'drink' - their own words. Today producing 65,000 bottles of Camel Valley wines per annum, each and every year he sells as much as he and his team can produce. So much so that the vineyard is in the process of being expanded from nine acres to 16. 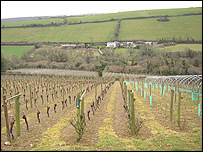 Based in a sweeping valley in picturesque north Cornwall, the south-facing vineyard also attracts 15,000 thirsty visitors each summer. "We have never advertised," says Mr Lindo. 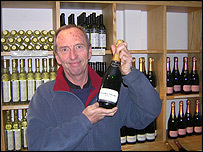 "Instead we were very lucky - our first wine won a bronze medal in a competition. We put out a press release and the coverage and sales just grew from there as we continued to win more prizes and people started talking about us." Made using a range of traditional grape varieties, Camel Valley wines are now stocked by a number of top UK restaurants, Waitrose, Asda, and a great many independent wine merchants. "There is a lot of mystique about winemaking, but I have to admit it is relatively simple," says Mr Lindo. "You just have to be entirely hands on, thoroughly clean and meticulous." There are now more than 400 separate wine producers across the south of England, destroying the misconception that the weather isn't warm enough to grow decent wines. Mr Lindo says the key point is they no longer have to "justify themselves". "The quality is now there and speaks for itself," he says. In South Wales, another up-and-coming small UK drinks company that grew out of a farm is also continuing to enjoy strong sales growth. Formed by Ben Jones on his small farm in Abergavenny, Monmouthshire, eight years ago, instead of wine, his Celtic Spirit company makes a range of apple brandy and whisky liqueurs. "It started out as farm diversification," says Mr Jones. "I started to make brandy from our own apples and sell them at farmers markets. "The quantum leap was when Tesco wanted to stock our products. We haven't looked back from there." Today Celtic Sprits products, such as Black Mountain Liqueur, are even sold by Harrods in London. Be it wine, or apple brandy, Mr Jones says the root of success is relatively easy for a small UK drinks manufacturer - start with an enjoyable, quality-conscious product and you are halfway there.